The Strategically Underpaid variation of the Anti-Selling Wound™ is best exemplified in consultants and service providers who work as part of a team. Often these people are capable of running the whole team, but for whatever reason they’re selling themselves short and only offering a sliver of their ability to the client, leaving the rest of the project to others on the team. But then when others on the team drop the ball or under-perform, this Strategically Underpaid consultant feels the need to pick up the slack – even though they’re not being paid for the extra work. This article is a case study of the Strategically Underpaid archetype. The article concludes with practical suggestions you can use if you’re guilty of under-charging for your services. Click here to return to the Anti-Selling Wound™ home page. 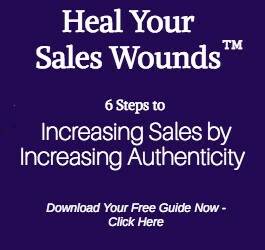 Click here for an overview of all 6 primary Sales Wounds™. Vania is a certified software consultant who typifies The Strategically Underpaid Anti-Selling Wound™ to a T.
Companies typically hire Vania when they are implementing online marketing initiatives, and her job is to make sure the software runs smoothly in the background. But Vania is also a marketing consultant, with a much bigger perspective of the moving parts required for a successful outcome than just the software. As such, she can see when various steps have been skimped on or skipped over altogether, and what kind of jeopardy the whole project is in as a result. 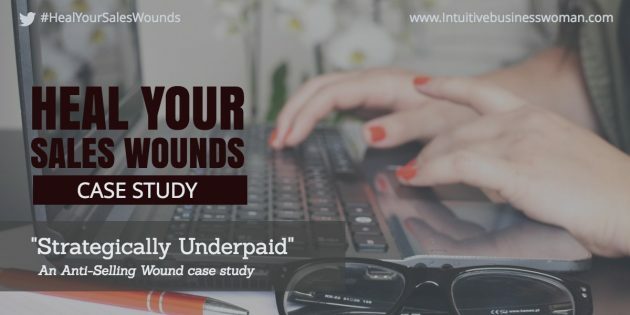 While she sometimes tries to explain to the client what she sees, the client is typically unwilling to spend the additional money, and/or underestimates how badly things are going to get screwed up. So Vania is left in the predicament that if she only does what she’s been paid for, the overall outcome will be less than optimal; and the client might even blame her, even though she did all her assigned tasks properly. As a result, Vania almost always does more than what she’s been paid for, because she cares deeply about the project’s success and the client’s happiness. What would be a better option for Vania? The best option would be to reposition herself as a marketing consultant rather than just a software technician. In this role, the client would be more likely to accept her advice about what’s missing in order to create a successful outcome for the project. The first step, of course, is to see yourself as more than “just a ____” – software technician, graphic designer, SEO expert, etc. While it’s the most important step, conquering the Inner Game is of course the most difficult. To help you with that, here’s a meditation to help you get clear on what you want. Provide a full list of the services you offer – including prices. When clients see that you aren’t just a ____ but that you offer more comprehensive services as well, they may just ask you about it! Present package options. A variation of the suggestion above, another way to communicate how much you’re capable of is to present a package that includes a lot more than what the client has been thinking you could hadle. Mention your MBA. If you have impressive credentials – an MBA from Harvard or years as senior management at a well-known company – make sure you mention it! Testimonials. Of course nothing says “I can solve your problems for you” like a testimonial from a past client! Raise your prices. While this can be very difficult to imagine doing, it’s absolutely true that if you aren’t charging enough you’re diminishing your value in the eyes of your potential clients. The other option – if the client is simply unwilling to help set Vania up for success – is for her to walk away from the sale. Read more: Boost Your Business: Learn to Say No.